Joe English of KATU News hits the “Twilight” premiere party at Rocket on Thursday night, before heading to Lloyd Center Cinemas where fans wait in line for the midnight screening. PORTLAND, Ore. – One of the most anticipated movies of the year is hitting the silver screen and fans could not be happier. 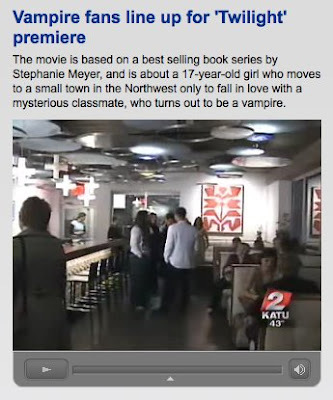 Twilight, based on a best selling book series by Stephenie Meyer, is about a 17-year-old girl who moves to a small town in the Northwest and falls in love with a mysterious classmate, who turns out to be a vampire. The movie holds a special interest for folks in our neck of the woods because many of the scenes were shot in Oregon and Washington. And a lot of the cast and crew are locals, like 7-year-old Catherine Grimme from Portland, who played the main character Bella as a little girl. What will we be casting next?